14 months after launch, the C3 Aircross hits a record 2.5% share, helping Citroen up 14.7%. The pre-WLTP rush aftermath, after cutting new car sales in France by 12.8% in September, has greatly reduced its impact with October registrations down just 1.5% to 173.799, in fact -5.8% in daily rates given this month has one additional opening day compared to October 2017. The year-to-date tally is now up 5.7% to 1.836.481 which is now the 4th largest 10 month volume in French history below 1990 (1.973.172), 1989 (1.921.716), 2001 (1.912.485) and 2011 (1.837.474). Private sales happily go against the market at +3.3% to 92.635 sales and 53.3% share vs. just 50.8% in October 2017. In contrast, artificial sales are logically panting with short-term rentals freefalling 24% and demo sales down 4%. So far this year, private sales also outpace the market at +6.7% to 881.500 units and 48% share vs. 47.5% over the same period in 2017. 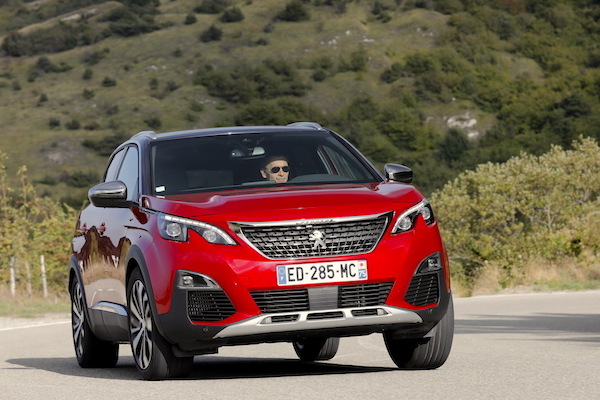 Peugeot is the best-selling carmaker at home for the 6th time this year: a first. Peugeot (+8.3%) vastly outperforms its home market once again to remain in first position for the 6th time in the past 10 months, a situation unheard of before in France. The brand benefits from its outstanding handling of the transition to WLTP with its entire lineup compliant well before the September 1 deadline, and crosses the symbolic 20% share mark for the 2nd time this year – and this decade – bettering its score to 20.12%. Peugeot sees its company sales up 9.5% (including long-term leases) to snap the #1 brand title on this channel with 12.569 sales vs. 10.486 for Renault (-8.2%), its private sales grow by 6.5% to 15.808, demo sales are up 21% to 4.041 and self-registrations are up 41.7% to 1.136 due to the launch of the Rifter and the new generation 508. 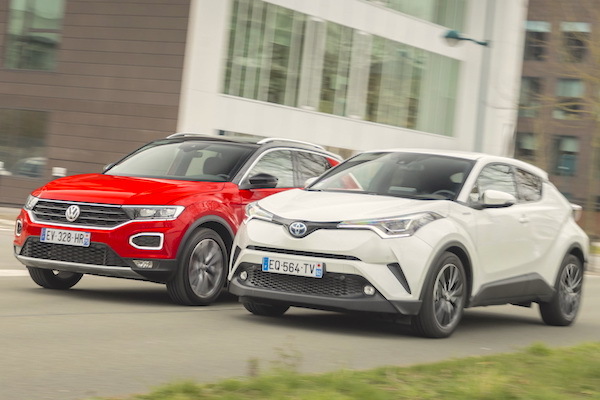 Toyota outsells Volkswagen to rank #1 foreign marque in France for the 2nd straight month. Renault (-9.7%) falls faster than its home market, once again paying the price of overusing artificial registrations in the pre-WLTP period last summer. Showing an encouraging turn of events, Citroen (+14.7%) posts a third double-digit gain in the past 4 months to hit 10.8% share, its highest since last January (11%). Even more encouraging is Citroen’s stunning 33% uptick with private buyers this month. Cementing its 4th place YTD above Volkswagen, Dacia (+19.4%) brilliantly signs the largest gain in the Top 15, while Toyota (+18.3%) also posts an extremely strong result to remain inside the French Top 5 for only the 2nd time in history after last month. Other great performers include Mitsubishi (+69.4%), Seat (+26.5%), Volvo (+22.2%, +38% for private sales), Skoda (+15.5%), Mercedes (+14.7%, private +17.6%), Ford (+13.7%, private +17.6%), Honda (+12.9%), Jaguar (+12.7%), Mini (+8.2%), Hyundai (+8%, private +19.6%), Kia (+7.9%) and Opel (+5.2%, private +16.9%). At the other end of the scale, Volkswagen (-23.6%) whose lineup isn’t yet 100% WLTP-compliant, continues to struggle but the hardest hit in the Top 20 are Audi (-53.3%) and Nissan (-48.6%) and further down Infiniti (-93%) at 10 sales vs. 421 in August, Ssangyong (-76.6%), Alfa Romeo (-71.3%), Porsche (-71.3%), Tesla (-67.7%), Land Rover (-61.3%) and Subaru (-56.7%). 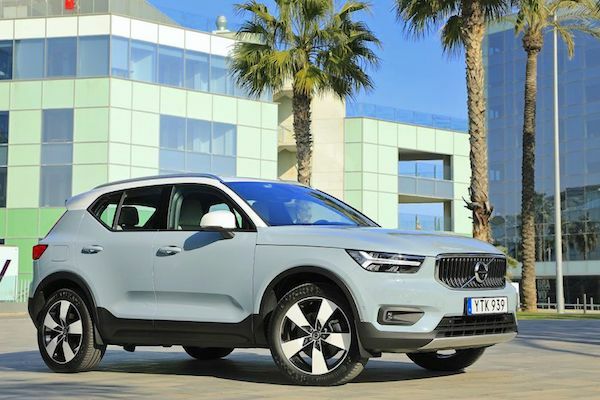 Volvo private sales soar 38% year-on-year in France this month, mainly thanks to the XC40. The top of the models ranking returns to the YTD order with the Renault Clio (+9%), Peugeot 208 (+6%), Peugeot 3008 (+15%) and Citroen C3 (+20%) the most popular. In fact, the entire Top 6 best-sellers go against the market and post solid gains: add the Peugeot 308 (+7%) and Dacia Sandero (+17%), and there are only 3 declining nameplates in the Top 16: the Renault Megane (-25%), Captur (-21%) and Peugeot 2008 (-7%). 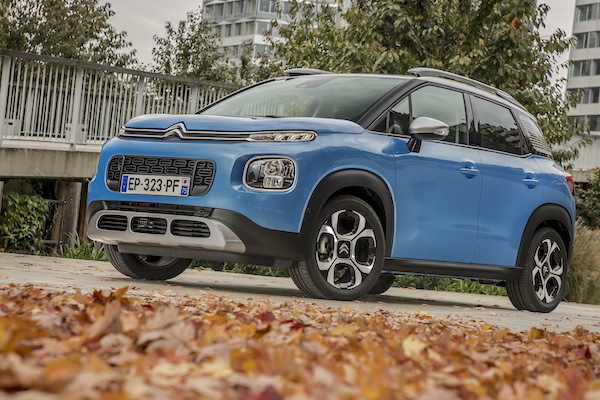 The Citroen C3 Aircross soars 101% to secure its 4th ever Top 10 finish at home at #9 after last January (#10), July (#9) and September (#10) and the Renault Twingo (+30%) continues to take full advantage of ongoing scrappage schemes. At #11 overall the Toyota Yaris (+26%) confirms it is the new favourite foreigner in France – albeit produced locally – distancing the Ford Fiesta (+61%) at #14, Opel Corsa (+39%) at #16, VW Polo (-13%) at #17, Fiat 500 (-4%) at #18 and VW Golf (-43%) struggling mightily at #22. The Citroen C5 Aircross appears inside its home Top 150 this month. Other great performers inside the Top 50 include the DS 7 Crossback (+581%), Renault Zoe (+125%), Fiat Panda (+80%), Toyota C-HR (+70%), Peugeot 508 (+56%) up 87 spots on September to #44 thanks to the new generation, Opel Crossland X (+51%), Ford Focus (+50%), Citroen C4 Cactus (+49%), Ford Ecosport (+44%), Citroen C1 (+38%), Dacia Duster (+36%) and Mercedes A-Class (+35%). 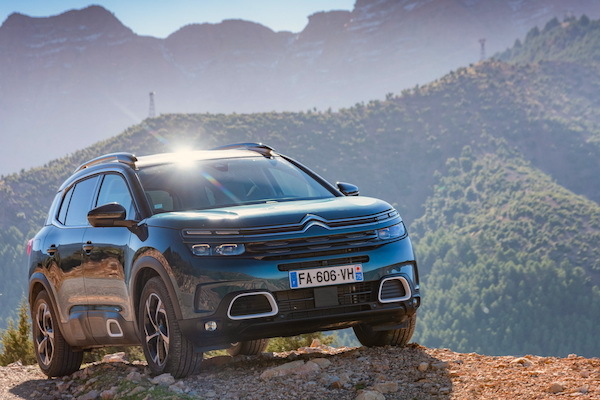 The Citroen C4 Spacetourer (#19), VW T-Roc (#29), BMW X2 (#67), Volvo XC40 (#75) and Peugeot Rifter (#90) top all recent launches (<12 months) while we welcome the Citroen C5 Aircross at #144. Among private sales, no less than 7 of the 8 best-sellers post at least a double-digit gain, with the Dacia Sandero (+20.1%) reclaiming the top spot to holds YTD off the Peugeot 208 (+13.3%) ahead of the Renault Clio (+10.2%) and Citroen C3 (+29.7%). The Citroen C3 Aircross (+208.8%) hits its highest private ranking so far at #6 (previous best #7 last August) just as the Renault Twingo (+61.8%) and Dacia Duster (+40%) take off. Full October 2018 Top 40 brands, Top 270 models and Top 10 private sales below.